We have used the latest technology to guarantee the perfect fit, feel, grip and maximum durability. Our gloves are easy care and hand washable. Put the gloves on and wash gently in lukewarm water using mild detergent or soap flakes. Remove gloves and rinse thoroughly in clean water. Squeeze out all excess water from fingers downwards and pull gently into shape. Hang to dry away from direct sunlight or heat. Light coloured gloves should not be washed with coloured articles. Coloured gloves may be washed with articles of similar colour provided instructions are followed. For best results please wash gloves before they become too soiled. 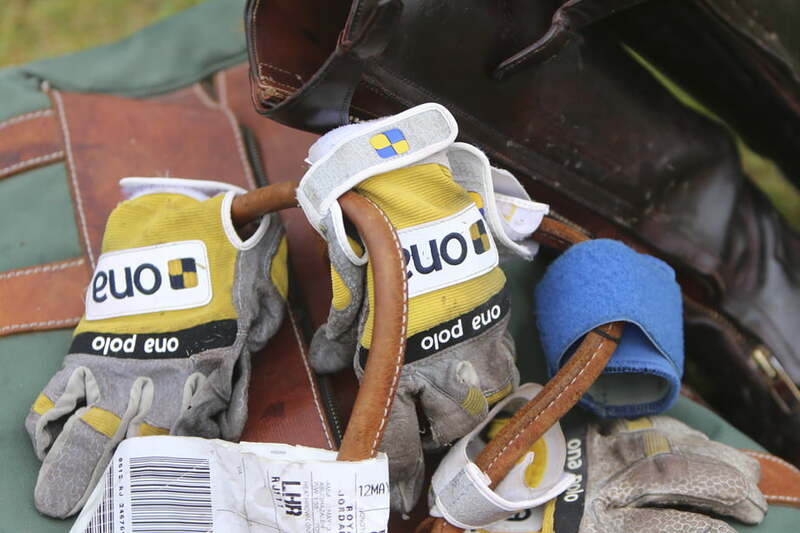 In order to extend the life of your Ona polo gloves always after chukkas hang out to dry and bring into shape. 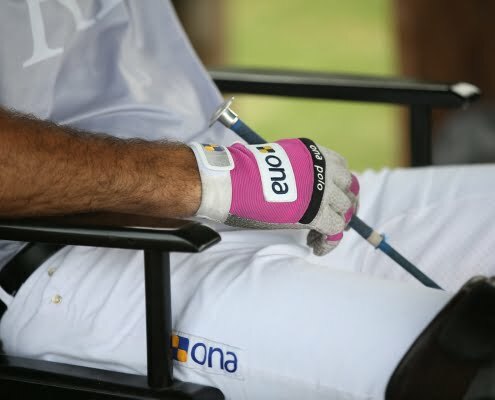 Your Ona Elbow Guards have been treated with Polygiene, the latest technology in odor control. Polygiene inhibits the growth of bacteria. This ensures an extended life of your Ona Elbow Guards. Your Ona Elbow Guards are machine washable. Please follow the care instructions. Wash at 30 degrees and preferably in a laundry bag to ensure that your Ona Elbow Guards retain its original shape. Dark colours should be only washed with articles of similar colour. Hang to dry away from direct sunlight or heat. Your Ona Polo Whites are made of technical performance fabrics which are easy to care, simple to wash with a fast drying time. However, it is important that you read the care instructions before washing. Your Ona Polo Whites are machine washable. These should only be washed with light coloured items. Please do not use bleach or whitening agents. You can also have your whites professionally dry cleaned using solvents R113 or hydrocarbon. Very gentle wet cleaning is also an alternative method. Always hang to dry, do not use a tumble drier. Use mild iron for pressing. Your Ona Base Layer has been treated with Polygiene, the latest technology in odor control. Polygiene inhibits the growth of bacteria. This ensures an extended life of your Ona Base Layer. Your Ona Base Layer is machine washable. Please follow the care instructions. Wash at 30 degrees and preferably in a laundry bag to ensure that your Ona Base Layer retains its shape. Dark colours should only be washed with articles of similar colour. Equally, light coloured base layers should only be washed with light coloured items. In order to retain the “always dry” properties of your Ona Base Layer, please do not use fabric conditioner. Hang to dry away from direct sunlight or heat. Your Ona Polo Boots are made of full grain Italian leather which have a water repellent treatment. WRAT (Water Resistant Advanced Treatment) technology which uses hydrophobic materials that are bonded to the leather structure during tanning to form a protective water, wind and crack resistant barrier. Nevertheless, in order to guarantee the integrity of the leather and extend the life of your boots it is highly recommended that you clean your boots after each use. Using a wet cloth or sponge, gently wipe off the outside of the boot. Don’t be afraid to use a lot of water to remove the salt and sweat as well as the dirt. Towel-dry the boots and let them sit for a half hour to an hour to dry. Once completely dry, apply boot cream (NOT boot polish) designed specially for riding boots. Allow the cleaner time to be absorbed into the leather. With a soft rag, apply a small amount of boot polish (brown or black, depending on the colour of your boots) in a circular motion to the leather. Allow the boots to sit for a half hour or so. Take a boot brush, old piece of cotton cloth, or a specially designed shine sponge to buff the leather and bring out a high shine. Put your saddle on a saw horse, saddle rack, or something similar to hold it up while you clean it. Get two clean sponges, a small bucket full of warm water, some form of saddle soap and some neatsfoot oil or leather dressing. Dip one sponge in the warm water, gently wring it out and put some saddle soap on it. Place the sponge on the saddle with saddle soap facing down, and rub vigorously over the whole saddle. Make sure that you get all the leather parts of the saddle on both sides, putting more saddle soap on every once in a while. Wash the saddle soap off the sponge in the water, then wipe the saddle with the sponge to remove the soap . Since leather loses moisture and fats over time, it will need to be conditioned. However, if you over-condition your tack, it will get greasy and the stitching and leather fibers can deteriorate; frequent, light conditioning will skirt the problem. Use a towel to apply a light layer of conditioner. Avoid products that are petroleum-based, as they will dry out the leather through fat emulsion. If over-used, neatsfoot oil will rot stitching, but can work fine if used sparingly; it gives leather a dark color, however. Olive oil works as well. In order to preserve the integrity of your bridle and for safety reasons in particular, it is essential that you care for your Ona Polo bridle. While cleaning and oiling you’ll also be checking for broken leather, stitching that may need to be replaced. Keeping your leather gear oiled will prevent cracks and you will also be impeccably turned out for games. A smooth bridle is also easier to handle. 1. A Hoof Pick -Often bridles have buckles and holes that require some tempting. You can use a hoof pick as it is easy to hold and isn’t going to mark your leather. 2. Tooth Picks -Use these to get dirt and muck out of holes as well as pushing cleaning products through holes on throat latch and nose band, as they may become clogged with wax. 3. Towels or Cloths -It’s best to have a separate towel for the first cleaning, to remove dirt and grass build-up, a second one for the oiling, a third for wiping the oil and wax off, and a fourth for polishing and shining the leather. You don’t need to have 4 but it is recommended you have more than one or two. 4. Newspaper -If you’re inside newspaper is essential so you don’t get oil and wax on the kitchen table, or on the floor, as they can become slippery and may stain the furniture. It is best to clean outside as the smells may cause asthma and breathing difficulties. 5. A Bucket and Warm Water – To clean and rinse bits and chains. Undo reins and bit from the bridle. Soak the bit in a bucket of warm water. Don’t add any detergent, as they contain products that are not good for horses. This time is available for soaking. Undo all buckles and put the pieces in a formation so it resembles a bridle and where each piece should go. Start by using the first cloth to rub down the leather, making sure you remove any built up grass and dirt. If the bridle has stains or marks, keep these in mind and you can fix these later. You can also use some saddle soap to clean the leather. Oil the bridle so it is shiny. It is beneficial to use the oil generously so it will soak in. You can oil each piece and let sit while you begin on other pieces. Then when you get back to the first piece, it will have soaked in enough. Make sure you apply liberal amounts of oil and wax to any parts that are prone to wearing such as loops, buckles and holes. Rub the leather down so you remove most of the oil and wax. Make sure you get inside any holes and loops. Using the final cloth, polish the leather, using short quick movements. The friction will help make it shiny. Using the tooth picks, poke every hole to remove wax and oil. And place all pieces in an logical order in preparation for putting it back together. Ensure you have an old toothbrush and toothpaste. Toothpaste is non-corrosive and doesn’t harm your horse, while giving a nice shine to your bit. You don’t want to remove the taste, however, as after years of riding, a bit will feel natural in a horse’s mouth due to the taste and smoothness. Clean the bit all over, making sure you scrub around grooves and joints. Rinse the bit and let dry. You can also rub it down to hurry up the process. Put all the leather pieces back together including the bit. Find any problems such as cuts and stains. To fix these, get a permanent marker the same colour as your leather. If you have a tan or brown bridle, you can get coloured beeswax which is used for cleaning sandshoes. Use the permanent marker by dabbing with the point until the mark is black. Because the leather is oiled, the mark will be less noticeable. Use a small amount of oil in your fingertips to rub over the marks, (when dried of course), to keep the colour from rubbing off.